Day 12: Today, identify something muddy that kept recurring for you throughout 2013, and then ask yourself this: What’s the clear truth underneath this damn mud if I finally wash myself clean?? I get stuck in it, again and again. It grabs at my ankles, slowing my pace, just as I try to race through life. The mud of time dries on my skin, cracks and crackles, weighs me down. All the things I want to do versus all the things I have to do versus all the time I don’t have. But the funny thing about time, you learn to love it, even as you fight it, even as it taunts you, even as it refuses to budge. And so, I embrace each moment. The good, the bad and the ugly, as well as the profound, the lovely, the beautiful. Each morning I arise and hobble (not jump) out of bed, and for that brief, single moment, I am clean. And then it’s time to go out and get my hands dirty, again and again and again. To wallow in my beautiful mess. To allow each day to be what it is. I watch my outdoor cat: he plays hard, runs through fields muddy or not, hunts and kills, hides and seeks, rolls on the ground to scratch his back. 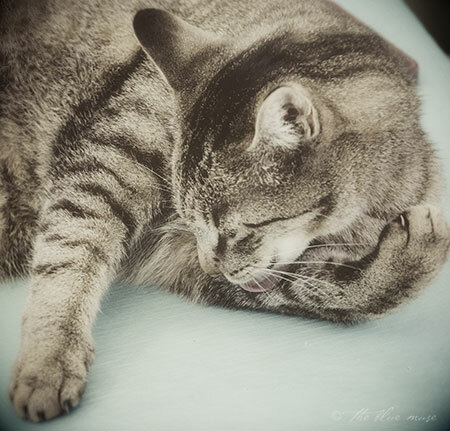 But always, at night, before he goes to bed, he spends a good half hour washing himself clean. And then he sleeps, hard and sound. In the morning, he is the first one up, ready to race out the back door and start all over. This entry was posted on Thursday, December 12th, 2013 at 8:21 amand is filed under . You can follow any responses to this entry through the RSS 2.0 feed. You can leave a response, or trackback from your own site. thats your lil brett favre! Time has been on my mind and this perfectly describes the tug and pull of it. Thank you for your gift of words! Aww Kelly, this is so true and resonates with me. We fight time and then we embrace all of it…. the good, the bad, the ugly…. the mess of it all.